Lynne and Murray Dalziell have had many different addresses over the last 40 years, as well as accumulating stamps from around 40 different countries on their passports. Their adventurous spirit and quest for new experiences have landed them in Cambridge, which they reckon is New Zealand’s ideal lifestyle location. “Cambridge is a great place to live. It has an excellent climate, a lovely rural outlook, top recreation options and good proximity to plenty of other places. Best of all, although it is growing rapidly, it is a small town, which means peace is easy to come by and you don’t have the traffic situation you have in larger centres,” says Murray. Having previously lived in the Bay of Plenty, Wanaka, Rangiora, Christchurch, Manawatu, Wairarapa, King Country and Gore, Lynne and Murray first moved to Cambridge in 2015. In 2017, they engaged Martin Lee of PGG Wrightson Real Estate, Cambridge, to sell the four-bedroom family home they had spent the previous two years building on 2 hectares, five kilometres north of Cambridge. Martin also had their next project waiting, a 0.275 hectare bare land block 20 minutes’ walk from the Cambridge CBD, where they are now building a new home. Although their inclination to travel has left them unsure whether they will permanently settle in the new Cambridge lifestyle home, their instincts for the property are strong. “This one will be fine; the place is as good as gold. Once you make your mind up, you have to go for it. Whether it’s right or wrong, you have to make a decision. Even though half of those decisions might be bad, that is the way to deal with life,” says Murray, whose earlier career includes farming and a period as a successful stock agent. Whichever way it goes, travel will still feature large in the lives of the wandering Dalziells. “We have the caravan and will continue to go wherever the inclination takes us. We’ve lived, worked and travelled throughout New Zealand, mainly away from the big cities. We have one of the best countries in the world for travelling. You don’t have to go to far to see something memorable and amazing,” he says. “We spent 21 days in Vietnam. We found the people were wonderful, friendly, helpful and it is a cost-efficient place to visit. We came away with great respect for the country,” says Murray. 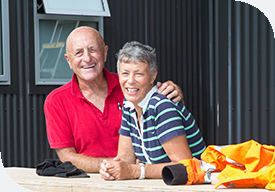 Having also worked and travelled in the United Kingdom, toured through Europe, and enjoyed a 10 year stint in Australia with six years working in an underground mine, Lynne and Murray have a treasure trove of travel experiences and plenty of stories to tell. “We are not ready to stop yet and there are still a few more countries we need to see. Canada and Alaska are next on the list, sometime soon,” says Murray. As well as its other attractive lifestyle qualities, Cambridge and the house they are building, is the ideal base for the Dalziells to launch their continuing adventures.